The club was a buzz with celebration following the newly formed adult synchronized ice skating teams unexpected gold medal success from the British Synchronized Skating Championships and National Opens 2010 held at Ice Sheffield on 18 and 19 February. programme until late October. The team consisted of 14 skaters with an age range of early 20s – mid 50s some of whom had only been skating 18 months. Despite all having many other commitments the team showed a great determination to do well and trained hard to develop an innovative routine with a Bollywood theme for their first competition. included a Level 3 element competently executed by the skaters and was able to withstand a one point deduction to carry them through to victory above their closest and more experienced rival ‘Orion’ from Lee Valley and teams from IceSheffield, Altrincham and Slough/Chelmsford. 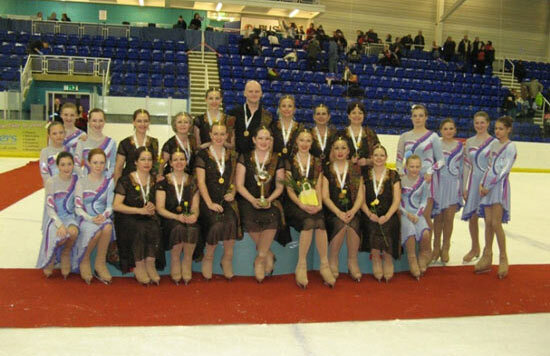 The team now hopes their success will help grow the synchronized skating section of the Bracknell Ice Skating Club over the coming months. There is already a small newly formed U18 team who were placed 9th out of 10 in the Elementary section at the championships and new members would be most welcome. Synchronized skating training takes place each Friday from 6.15pm to 8.15pm. For more information please contact: Club Chairman Lesley Brenikov or email: info@bracknell-ice-skating-club.co.uk.